In terms of tweet publication times, the scraper I used defaults to GMT, and it reports two different times, separated by an hour. I don’t (yet) know an easy way to modify the times, other than just winging it as I write. I’ve excluded tweets that I have made from the results. I also want to shout out to Johnathan Hutchinson for showing me this method. #ANZCA14 was the official hashtag for the conference. I collected tweets from the 6th to the 12th of July GMT, which covers a smattering of chatter a couple of days before the pre-conference, right up to the post-conference morning well-wishers. Our first poster Cinnamon Mind, whose IRL name is likely different, and who I don’t think I met. They posted at 10:36am on Sunday the 6th. The last post that I collected came from John Tebbut, 10:14am on today, Saturday the 12th. 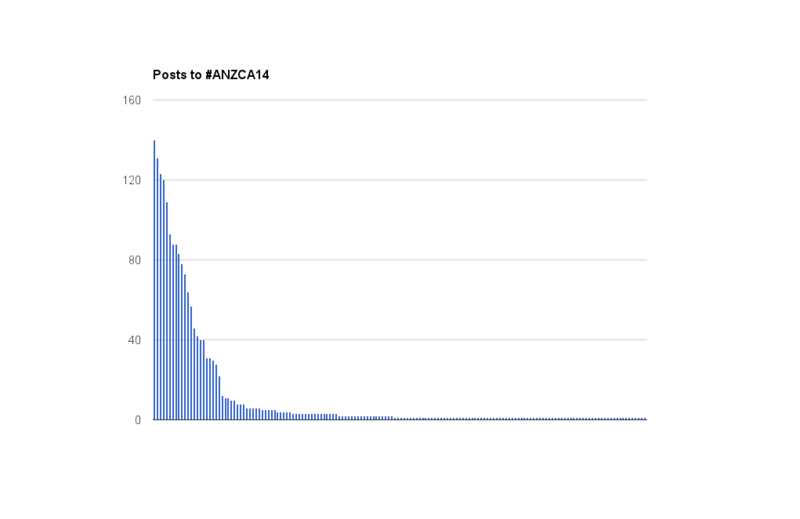 In the period covered – exactly 6 days or 144 hours – a number of different accounts contributed to the #ANZCA14 hashtag, which including many of our keynote speakers, the attendees, and what I think were the chefs at the conference dinner. Beyond the small wobbles at the start (pre-conference hype), the first peak is the postgraduate preconference, as organised by myself and Emily van der Nagel. We can see that the most tweets occurred at the second peak – the first day of the conference. The second day was distributed throughout the day a bit better, while the last day never reached the heights of all the other days, while extending on a fair bit longer. I think we can attribute this to people having to catch flights out of town, and then trying to organise more and more people on towards post-conference drinks. There’s a very tiny ripple at the end, which I should note is mainly people footnoting things they meant to say during the conference, or wishing people well (or posting long-winded, uninteresting SNA analyses of conferences, amirite?). Doing some fairly crude arithmetic, which is in no way statistical, we were getting about a tweet per minute during the conference hours themselves. I’ve had trouble getting processing tools to work with any ‘time’ metadata, so the figure it simply based on the number of conference days (4), and the number of conference hours (8 per day, plus 4 overall for the associated conference activities). This comes in at about 52 tweets per hour. 1) Our biggest retweeter was ElizabHk, for whom 46% of the tweets were retweets. 2) As I already mentioned on twitter already, our most central scholar was Jason Farman – he eclipsed all others users by being in interaction with over 160 other tweeters during the conference. Next was Johnathan Hutchinson with 74. 3) AShieldsDobson was the most generous retweeter, with 100% of their tweets being retweets. I haven’t worked out 100% how to get the data about RTs out of the program I’m using, but it was the only thing that I saw that had more than 3 retweets. 5) At least one other hashtag seemed to get small amount of use: I scraped #anzca2014 and found 8 tweets from early in the conference from people who either bowed out at that point (1 person), or got on the #ANZCA14 gravy train. Only 58 tweets led to having replies – I’d initially described this as a non-dialogue. As Rowan Wilken noted, that’s probably because we’re not intending Twitter to be the site of ‘real’ dialogue, but rather as a means of broadcasting the panels we had observed. Anthony McCosker added to this that the metadata is perhaps not indicative of how discussions were unfolding anyway. I agree with both of them, and have a belief that a lot of the dialogic communications were happening face to face. 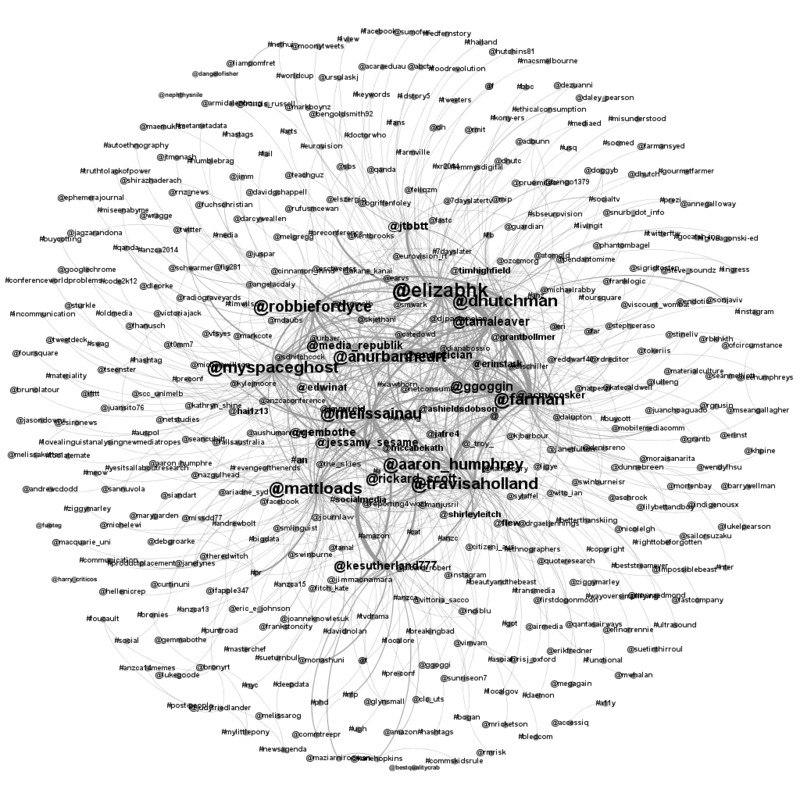 I’ve used Gephi, following some blog posts I found, to create a visual representation of connections between identities and hashtags. 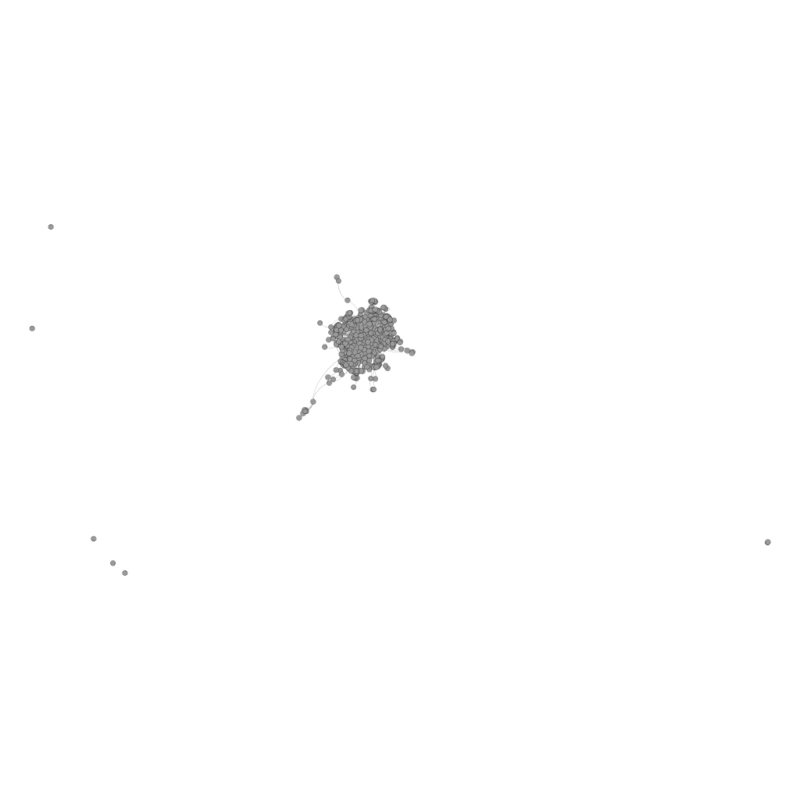 These have become my ‘nodes’ for the graph data. This analysis is not to do with individual volume, but rather with individual connectivity – i.e. the level of engagement between a user and their community. This is represented by the degree to which they include others in their postings by either mentioning them, or mentioning a hashtag. You might be able to spot the outliers on the far left, and the duo of nodes on the far right of the image. Trying again with a Fruchterman Rheingold algorithm left me with a distribution that attempted to (I think) centralise the individuals with the most connections – i.e. putting them equidistant from their communicators. I then applied a label weight feature to indicate the number of their connections to their counterparts. The bigger the text, the more times individuals connected to other people. We’re a communications studies association, at a social-media themed conference so we might assume that there’s a fair amount of social media usage. There may well have been plenty of other communication going on over other channels. I’ve used PiratePad in the past for my collaborative conference notes, and Facebook, Xabber GChat, and email have been used for similar communicative channels at the conferences I’ve been to. I would say, though, that while there’s a fair amount of chatter, I don’t know to what extent there’s much reach outside a central pool of tweeters. Several people were paying attention externally of the conference, so there was at least some reach outside a closed bubble, but I think that’s the limit to which this piece of SNA can understand of #ANZCA14. Thanks for sharing this Robbie! What’s the difference between factoids #1 and #3 (“biggest retweeter” and “most generous retweeter”)? Generous is, admittedly, not the best term to describe this quotient, as it makes assumptions about intentions.